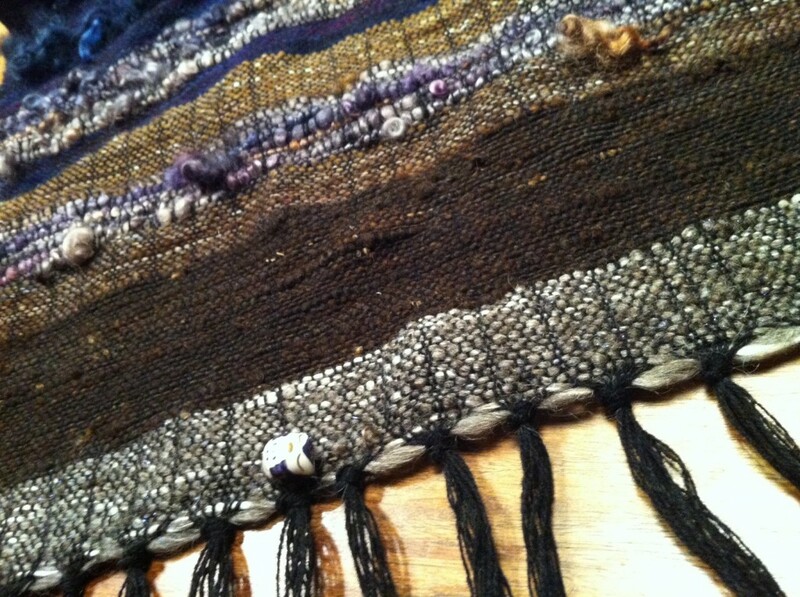 Home » Featured » Looming Projects! Anyone who has visited my Facebook page recently would have already heard, multiple times.. that I have a new obbsession occasional craft activity, enabled by the arrival of my wonderful Saori loom. Its my very first delving into weaving. Why? (various loved ones did ask this of me) My daughter instantly cracked up because, well, in one episode of ‘Big Bang Theory’ Sheldon loses his job and slowly goes insane, this insanity expresses itself in various odd activities including weaving. 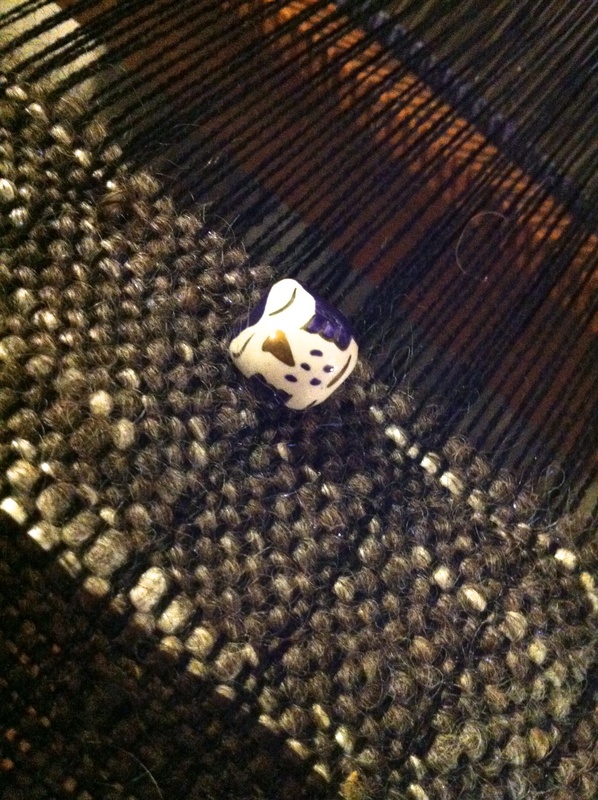 My Mum wondered if I was going to have time to indulge in another craft, and my husband (bless him) saw flying euros speeding out the window at an even greater rate of knots than previously. My littlest one however, (he’s 4) was very enthusiastic, and after seeing the loom just for a few moments was already keen to try it out himself. It went pretty much the same way as his attempts to drive the car. His legs are just too short to reach the pedals, however he really liked to catch the shuttle and send it flying back, and he is convinced that we are making a bag for him. In some way. I have a Saori loom, because: I think its beautiful, it has treadles, and apparently I require both foot and hand activity with fiber, it has shafts, and a cute shelf to put my scissors and yarn on. Its very pretty, but Saori weaving is not a loom, Saori weaving does not require a Saori loom, as far as I know it can be done on pretty much any loom, even a cardboard square with notches cut in and yarn wrapped around to make a warp. 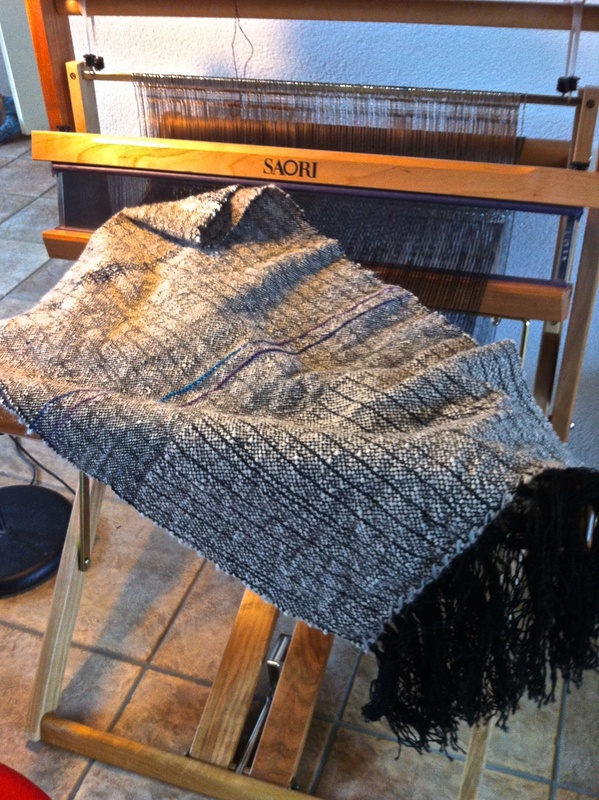 Saori weaving is a philosophy, and its what grabbed me and pulled me into the whole concept of weaving, because it fits perfectly with the yarns I make. Saori weaving was developed in Japan only about 40 years ago, and the idea of it is total freeform, no counting, no pattern to follow, no repetition of design (unless you want it), its like weaving for the activity of weaving. This of course resonates with me, as I love to spin simply for the activity of spinning! I am hopeless at maths, and I have never been good at following patterns, or rules either for that matter. (I was a total punk rock rebel as a teenager too). 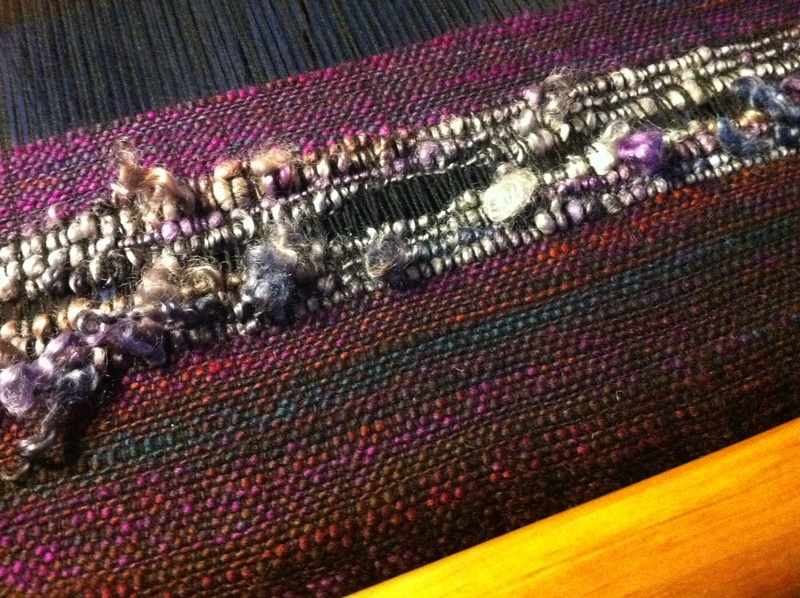 I decided that this is a style of weaving that fits me perfectly, and the yarns I create. Already I am anticipating how yarns are going to look when woven, I love the idea that the colours of the yarns will create the pattern in the weave by itself and its going to be exciting to watch that expressing itself as I weave. Once again I have found a totally colour-led activity 🙂 Or at least a way to make it into one! 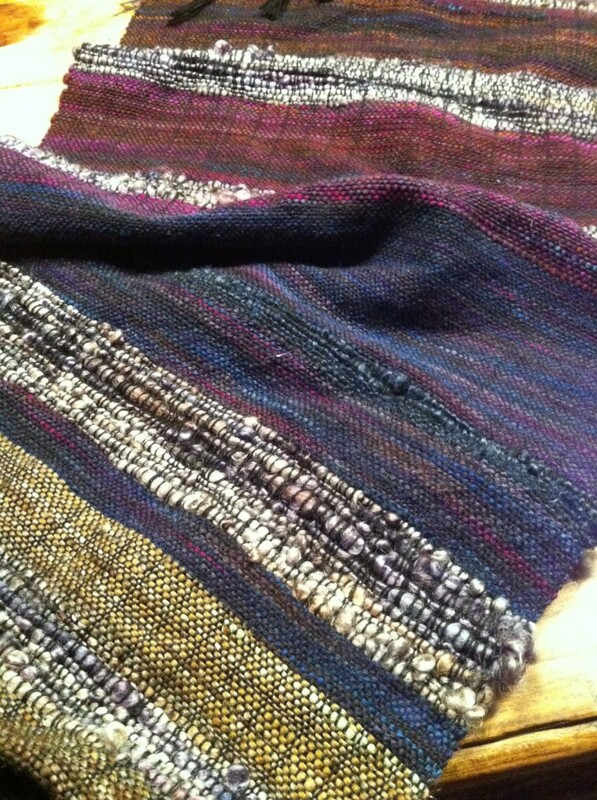 I made my first piece of weaving this week. I have to say it is one of the most satisfying craft activities I have ever done! I dont know why particularly, other than that to me, it feels a bit like when you put that final piece of jigsaw into the puzzle and complete it – all the fibers are so beautifully interlocked with one another, and everything just FITS 😀 For this wrap I used some undyed yarns that I had created as sample yarns for the Certificate of Handspinning that I did through the New Zealand Creative Fibers guild. These were all washed combed or carded to create specific yarns, I had a fine merino single, a bulky merino two ply, and the same yarns made with some lovely Corriedale. I also used a woollen spun (longdraw) Romney Lamb with its beautiful silver grey shade. I had to add some sparkle of course, so threaded in some sparkle blue yarn, and to compliment that and to see how it looked, I added some slivers of dyed faux cashmere roving, it was awesome. I restrained myself with difficulty to leave the colour at that, and I am pleased I did, I really love how the natural wool colours blend and vary through the wrap, and the few streaks of colour seem just right, not overwhelming, I think it ended up so much better than I thought my first weaving would turn out! And now of course, I am thoroughly addicted. There will be more weaving posts here on the blog in the coming months for sure 😛 But dont worry, I will continue to create yarns and batts as fast as I can, just expect that some will have to end up on my loom! My enabler on this path has been the lovely Patty, I believe she is the only Saori dealer in the Netherlands, and she has been hugely helpful with information, tips and ideas, and generally getting me started, what an inspiration! If you want to find out more about Saori weaving you can always pop over to her Facebook Page and say hi, and you can check out the Saori Global page, which has the history of Saori weaving , information about dealers, workshops, equipment, and of course the philosophy behind it. What follows is a little photo gallery of the second piece I have made. I also made a little story for it as I was weaving 😀 Its a landscape, it starts out with the silvery moon sparkling (there is lots of angelina in the yarn although it doesnt show up so well in the photo) and the little owl is sitting watching the moonlight shimmer. It shines down on the muddy river bank – rich dark Polwarth – which lightens towards the water. On the river banks are silvery grey stones – lockspun Wensleydale – lots of rounded smooth stones scattered along the banks. Then comes the deep and mysterious flowing water, changing colours as the riverbed beneath it changes, and reflectingthe night above and around it. Its interspersed with small islands of stones, and occasional rapids and areas of choppy water – tailspin Gotland. It ends with the night sky again, but this time the way it is dark just before the dawn as the moon has gone down. Just got a grown up loom (Kromski Harp 24″) and this is exactly how I feel. I blame you, Annette and Jenny for inspiring me! the red thread (not the red line)…it’s an old chinese proverb that says “An invisible red thread connects those who are destined to meet regardless of time, place or circumstance. This is absolutely beautiful! Thank you or a wonderful newsletter and all your wonderful ideas you share. Oh how I wih we lived closer!! 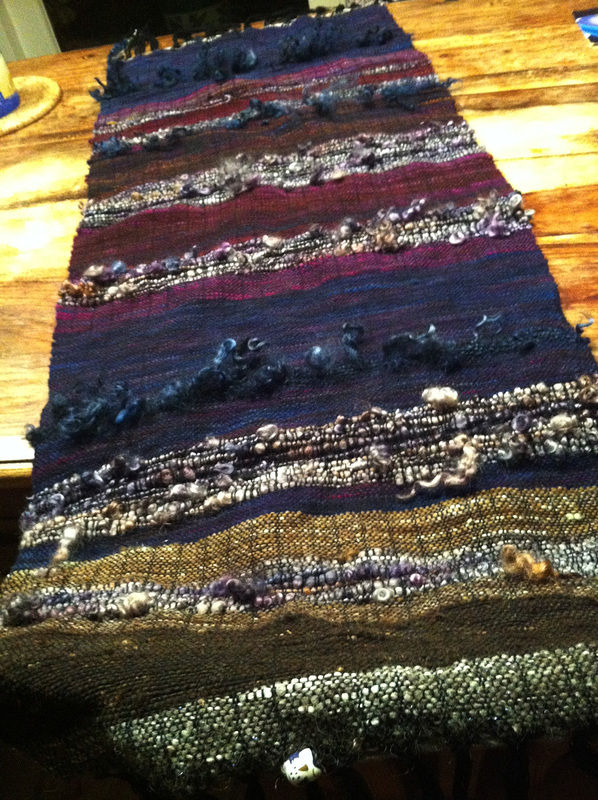 Beautiful work, Suzy, for your first try at weaving. I see all the areas you talked about. Interesting, isn’t it, that the more we “fiber” the more we “fiber”. What a nice newsletter to wake up to! I LOVE your weavings! A Sheldonesque obsession… hehe, I can totally see that happening! Wat is dit geweldig mooi Suzy. Schitterend! aw, dank je wel Annemoon 😀 I love how weaving lets the yarn really speak, you see all of it!